Have you ever driven home and arrived at your destination without remembering how you got there? No, you weren't abducted by aliens or taken over by your alternate persona. You simply experienced highway hypnosis. Highway hypnosis or white line fever is a trance-like state under which a person drives a motor vehicle in a normal, safe manner yet has no recollection of having done so. Drivers experiencing highway hypnosis may zone out for short distances or hundreds of miles. The idea of highway hypnosis was first introduced in an 1921 article as "road hypnotism," while the term "highway hypnosis" was introduced in 1963 by G.W. Williams. In the 1920s, researchers observed motorists appeared to fall asleep with their eyes open and continue to steer vehicles normally. In the 1950s, some psychologists suggested otherwise unexplained automobile accidents might be due to highway hypnosis. However, modern studies suggest there is a difference between driving while tired and automatic driving. Highway hypnosis is an example of the phenomenon of automaticity. Automaticity is the ability to perform actions without consciously thinking about them. People perform daily activities automatically all the time, such as walking, riding a bike, or performing a learned and practiced skill, such as knitting. Once a skill is mastered, it's possible to perform it while focusing on other tasks. For example, a person skilled at driving a car can plan a grocery list while driving. Because the stream of consciousness is directed at the other task, partial or complete amnesia of the time spent driving can occur. While driving "on automatic" may seem hazardous, automaticity may actually be superior to conscious driving for professional or skilled drivers. This is called the "centipede effect" after the fable of the "centipede's dilemma" or "Humphrey's law" after psychologist George Humphrey. In the fable, a centipede was walking along as usual until another animal asked it how it moved with so many feet. When the centipede thought about walking, its feet became entangled. Humphrey described the phenomenon another way, "No man skilled at a trade needs to put his constant attention on the routine work. If he does, the job is apt to be spoiled." In the context of driving, thinking too hard about the actions being performed may worsen the skill. For most drivers, the dull trance state they experience is really falling asleep at the wheel rather than hypnosis. 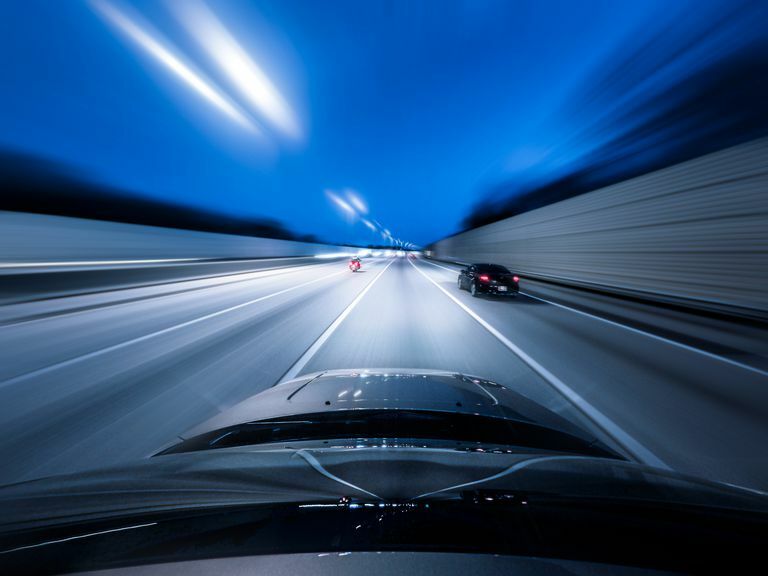 While a person experiencing true highway hypnosis automatically scans the environment for threats and alerts the brain of danger, a tired driver starts to experience tunnel vision and reduced awareness of other drivers and obstacles. According to the National Highway Traffic Safety Administration, fatigued driving accounts for over 100,000 collisions per year and about 1550 deaths. Drowsy driving is extremely dangerous, as it increases reaction time and impairs coordination, judgement, and memory. Numerous studies have shown sleep-deprived driving is more dangerous than driving under the influence of a 0.05% blood alcohol level. The distinction between highway hypnosis and fatigue driving is that it's possible to experience automaticity while being wide awake. Driving when tired, on the other hand, can lead to falling asleep at the wheel. Whether you're freaked out by the idea of driving on autopilot (highway hypnosis) or are tired and trying to stay awake at the wheel, there are steps you can take to improve your focus and wakefulness. Drive in Daylight: Driving during daylight hours helps prevent fatigue driving because people are naturally more alert under lighted conditions. Also, the scenery is more interesting/less monotonous, so it's easier to remain aware of surroundings. Drink Coffee: Drinking coffee or another caffeinated beverage helps keep you awake a few different ways. First, the caffeine blocks adenosine receptors in the brain, which fights sleepiness. The stimulant increases metabolism and directs the liver to release glucose into the bloodstream, which feeds your brain. Caffeine also acts as a diuretic, meaning you'll have to stop for a bathroom break more often if you drink a lot while driving. Finally, consuming either a very hot or very cold drink will command your attention. If you prefer not to take more bathroom breaks, caffeine pills are available over the counter to provide the benefits without the additional liquid. Eat Something: Munching on a snack gives you immediate energy and requires just enough attention to keep you on task. Have Good Posture: Good posture maximizes blood flow throughout the body, helping to keep you in top form. Crank the A/C: It's harder to fall asleep or into a trance if you're uncomfortable. One way to achieve this is to make the inside of the vehicle uncomfortably cold. During warm months, you can turn the air conditioner down to some arctic setting. In the winter, cracking a window helps. Listen to Music You Hate: Music you enjoy may lull you into a relaxed state, while tunes you loathe cause irritation. Think of it as a sort of audio thumbtack, preventing you from getting too comfortable to doze off. Listen to People Talking: Engaging in a conversation or listening to talk radio requires more concentration than listening to music. For most people, it's a pleasant way to pass the time while remaining clear-headed. For drivers who seek to get into the zone, the sound may be an unwanted distraction. Stop and Take a Break: If you're driving tired, you're dangerous to yourself and others. Sometimes the best course of action is to get off the road and get some rest! Prevent Problems: If you know you'll be driving a long distance, at night, or in poor weather, you can prevent a lot of problems by making certain you're well-rested before starting the trip. Catch a nap before trips that start later in the day. Avoid taking medications that make you drowsy, such as antihistamines or sedatives. Peters, Robert D. "Effects of Partial and Total Sleep Deprivation on Driving Performance", US Department of Transportation, February 1999. Underwood, Geoffrey D. M. (2005). Traffic and transport psychology: theory and application: proceedings of the ICTTP 2004. Elsevier. pp. 455–456. Williams, G. W. (1963). "Highway Hypnosis". International Journal of Clinical and Experimental Hypnosis (103): 143–151.